This Week’s Question: Why Does the Sun Burn Us? The sun keeps our planet warm enough for living things to thrive. It gives us light so we can see. But it also can burn us. What causes these burns? Keep an eye on the sun’s space weather activity from your classroom with a Space Weather Action Center. This computer-based activity allows students to track the development and progress of solar storms in near-real time. The activity incorporates online NASA data and addresses national education standards in science, technology and mathematics. Less Than ONE MONTH Until the Total Solar Eclipse! Potentially, more than 300 million people in the United States could directly view the Aug. 21 total solar eclipse, and NASA wants everyone who witnesses this celestial phenomenon to do so safely. 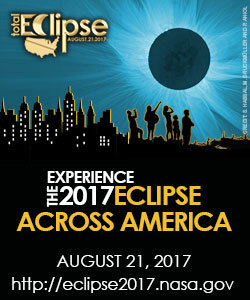 Get the latest safety information before the big event! NASA’s RFID-Enabled Autonomous Logistics Management, or REALM, project is seeking storyboard ideas for a two-minute animation that describes its mission to the public. REALM is a three-phased experimental project based on radio frequency identification, or RFID, technologies. This Week’s Question: How Do We Look for Earth-like Planets in Other Solar Systems? Exoplanets are very hard to see directly with telescopes. So how do astronomers hunt for them? Check out the latest Space Place in a Snap video to find out! How can a large telescope flying high above Earth in a 747 aircraft help a spacecraft zooming through the distant reaches of the solar system? Watch this “Kuiper Belt Object Chasers” video to learn how the SOFIA telescope is helping the New Horizons mission team guide their spacecraft for an upcoming flyby. Less Than Five Weeks Until the Total Solar Eclipse! When the sun’s light is blocked during an eclipse, does the temperature in the path of totality drop? Download the GLOBE Observer app and be a citizen scientist during the solar eclipse on Aug. 21, 2017. Use the app to make scientific observations of how the eclipse changes the atmospheric conditions in your area. **NEW** All Aboard! The NASA Education Express Is Turning 20! This Week’s Question: Where Is Juno? Earlier this week, the Juno spacecraft flew directly over Jupiter’s Great Red Spot, the gas giant’s iconic 10,000-mile-wide (16,000-kilometer-wide) storm. Visit the link below to see Juno’s current position! Learn more about the Juno mission to Jupiter and what scientists hope to learn as the spacecraft gets closer to Jupiter than any mission ever before! Bill Nye explains what makes Jupiter a treacherous and curious place in the “Why With Nye — Mission to Jupiter” video series. Less Than Six Weeks Until the Total Solar Eclipse! 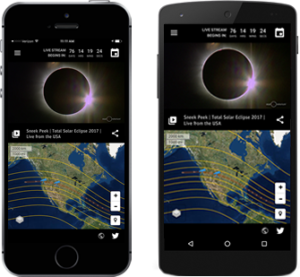 Download the Total Solar Eclipse 2017 App for access to live video streams of the total solar eclipse! To learn more, visit https://www.exploratorium.edu/explore/apps/total-solar-eclipse-app. Construct a model of a volcano. This Week’s Question: What Is an Urban Heat Island? As summer temperatures rise, some areas feel the heat more than others. Find out what an urban heat island is and what causes this hot phenomenon. Become a Mosquito Habitat Mapper with the GLOBE Observer app. Download the app and help scientists reduce the threat of mosquito-borne diseases in your community. 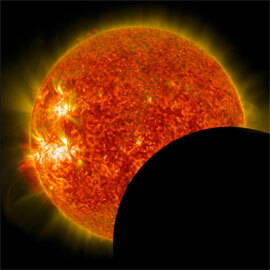 Less Than Seven Weeks Until the Total Solar Eclipse! Does a solar eclipse produce harmful rays? Can a solar eclipse happen at either of Earth’s poles? Does the moon turn completely black during a total solar eclipse? Find answers to these questions and explanations of other Eclipse Misconceptions!